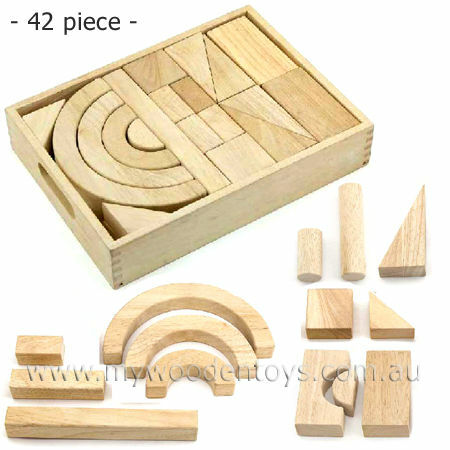 Wooden Blocks Beech 42pc Set this beautiful set of forty two wooden blocks in a very sturdy wooden tray with carry handles. These building blocks are made from solid beech wood have rounded edges and are beautifully finished to a very high standard. These blocks come in various shapes and sizes including beautiful half circles which nest inside each other. A fantastic set which your children's children will be able to play with. The whole tray of blocks weighs close to 5kg. It is also a wonderful puzzle when it comes time to pack it all back into the tray. Size: Tray is 39 x 29 x 7.5cm and weighs approx 5kg. We like this because: "A perfect set of traditional blocks."